Kevin Ducksbury has 30 years’ experience in the charter industry. His career started on the Youth Trainee Scheme with Monarch Airlines, based at Luton, which saw him work in a variety of roles from Crew Controller in the H24 operations department to maintenance planner and then Ad-hoc Sales Executive in the company’s commercial division. After 11 years at Monarch in a variety of roles Kevin made the jump into aircraft charter broking as a commercial aircraft junior charter broker for the then Air London (now Air Partner). There he again moved into a number broking roles before entering into the management side of the business, which saw him promoted to the company’s Operating Board as Director of Middle East & Asia based in Dubai. 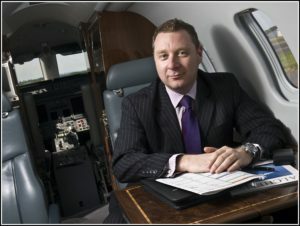 After leaving Air Partner 14 years later and returning to the UK in 2012, Kevin set up his own aviation consultancy and management services company, Emerge Aviation and since then has worked with a wide range of companies involved in the aircraft charter industry, from private jet operators in the Middle East to exclusive private jet catering companies in the UK ,where he has provided strategic growth and managerial support as well as commercial, operational and training know-how. Kevin lives on the Kent coast with his wife and two children. In his spare time, he enjoys playing the guitar, spending time at his beach hut and running his small holiday let business, based in Margate.